Some days ago I showed you a preview of the Chanel summer item I didn't expect to love: the Calypso Glossimer. 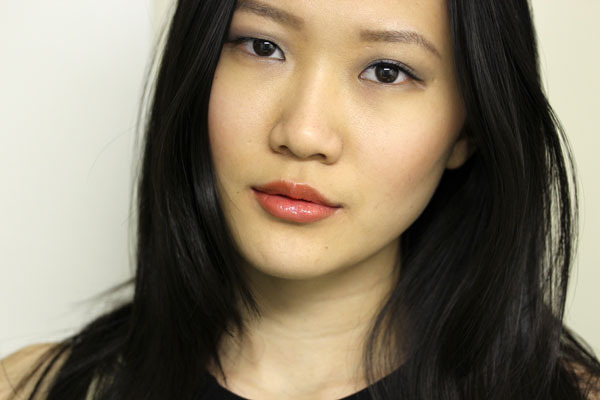 In the tube it looks like a hot orange shimmer confection, but on the lips it sheers out to a coral that leans orange. I am so smitten with the color that I've worn it for three straight days. 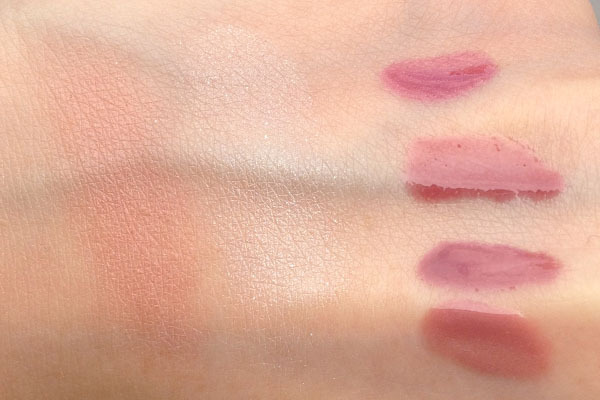 In the swatch, Chanel Calypso looks really similar to NARS Wonder, while LMdB Karla Sugar seems too dark to be considered a dupe. 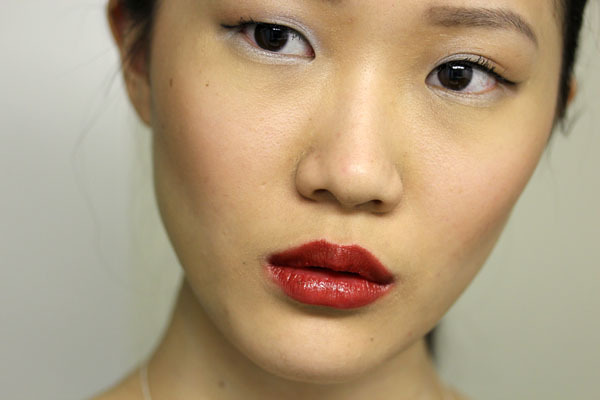 When applied on the lips, however, it's a whole different story. I forgot that Karla Sugar is a sheer brilliance lip gloss instead of a lip crème, thus while it swatches magnificently, it appears much sheerer on the lips. On the lips, Karla Sugar and Calypso were actually really similar. The only difference I could discern was that Calypso has hints of pink amidst the coral, while Karla Sugar leans more toward red. 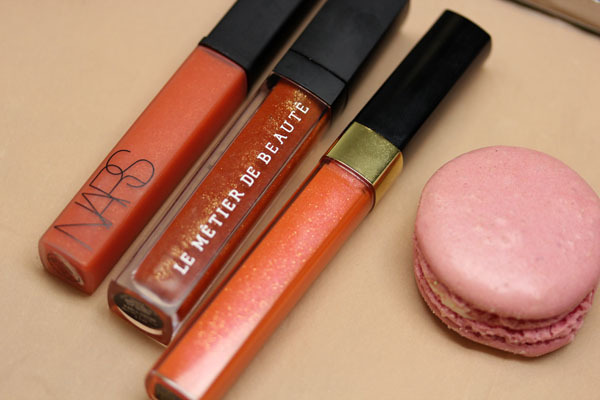 Another similar gloss is Dior's summer offering Orange Pareo, but that gloss contains more yellow. 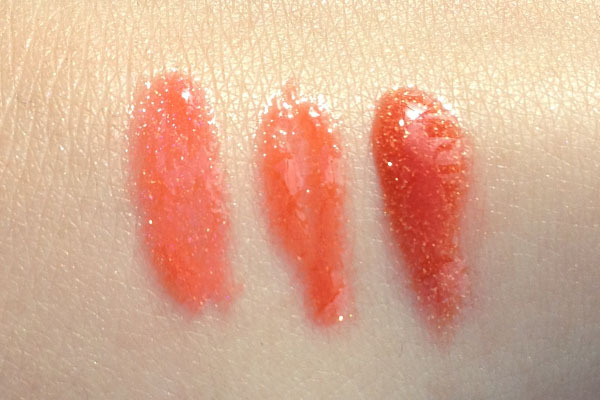 All three glosses mentioned are sheer, so the color might differ depending on the pigmentation of your lips. 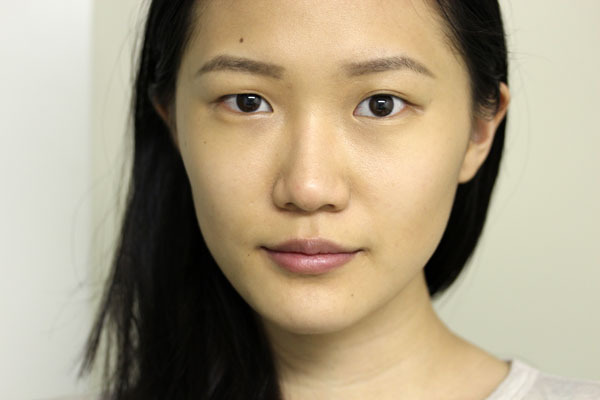 For reference, my bare lips are a light pink hue. On the other hand, NARS Wonder is considerably more pigmented than the other two, thus on the lips it's a rich, bright orange. All three are quite wonderful and spot on for the season (though Karla Sugar was a limited edition shade released last year and no longer available - for those unfamiliar to the color, it was made by the company in collaboration with, you guessed it, Karla Sugar). For those who are bummed about not being able to grab Karla Sugar while it was available, I think Calypso is a fantastic alternative. Chanel glossimers are usually too sheer to interest me, but Calypso shows up and transforms my lips into a twinkling coral. The Chanel glossimer formula is one of the better ones in the industry: lightweight, non-sticky, as well as scent and taste-free. Chanel Calypso Glossimer retails for $29.50 and is available at Chanel.com as well as Chanel counters worldwide (soon, if not already). I cannot stress enough how it is absolutely perfect for summer and you need it, I really can't. I always wondered how "the color of the season" happens. Is it the color of the season because magazines proclaim it? Or beauty companies bombard us with it? How does virtually every company come out with the same colors at the same time? And how do we really feel about Pantone and the yearlong Tangerine Tango plug? I personally wish they weren't so blatant about it. Anyway, I happened to notice I had two of the "colors of the season" on yesterday (in more ways than one, apparently - see iPhone cover below!). They make a fabulous combination. 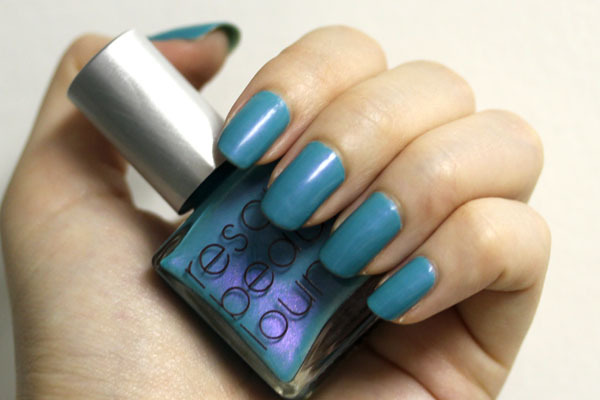 On my fingers is Rescue Beauty Lounge Aqua Lily from the recently released fan collection. You would think by now I should be sick of blue polishes, but I swear Ji can make even clear polish interesting, much less a color that has the potential for so much nuance. 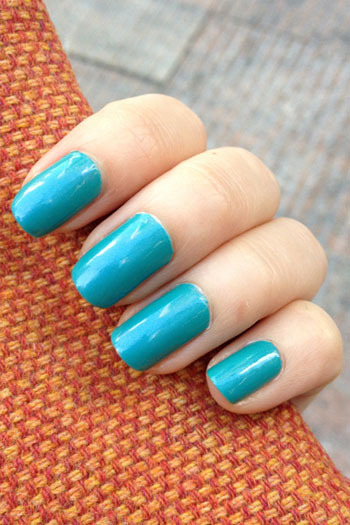 Aqua Lily is a teal blue that reflects violet shimmer in the light. My pictures don't do this color justice - I can't seem to capture reflected shimmer! This color requires two coats to achieve opacity, and is consistent to the RBL formula, which is to say smooth, pigmented, and an absolute pleasure to apply. At the moment, Aqua Lily (along with the fabulous International Klein Blue-inspired shade IKB: 2012) is sold out on the website, but Ji just posted an inventory update on her Facebook page saying they're both still available in extremely limited quantities. If you're interested in the colors, do follow her on Facebook for an update on when they will be available once again, or keep checking the website! Be warned: once it's sold out, it won't be available again unless voted back in the future. Rescue Beauty Lounge Aqua Lily retails for $20 and is exclusively available at rescuebeauty.com. Good luck to anyone who's jonesing to snag one! 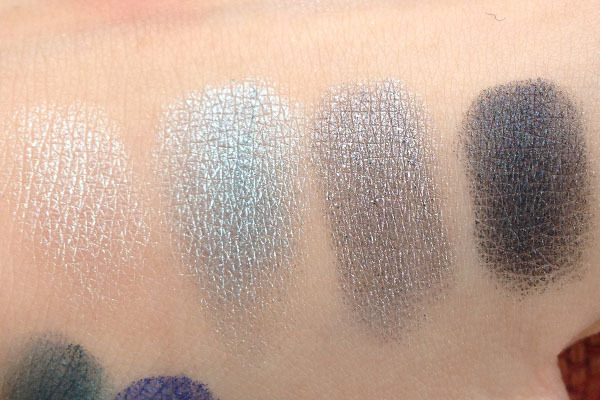 Apparently, this is my new thing – I go to counters and swatch the entire collection, for both your benefit and mine. I realized that by doing this I effectively eliminate half the things I want to buy, though on the downside (or upside?) I become enamored by things I previously didn't even think of getting. Case in point: before I went to the Giorgio Armani counter, I thought I was only interested in the Eyes To Kill Intense eye shadows, but after my impromptu swatch session, I was completely willing to forsake them for the lip glosses. I couldn't capture the duochrome shimmer of the ETK Intense Madre Perla. While the photograph above shows a simple white shimmer shade, in real life it actually reflects green/violet! I also didn't do Obsidian Black justice - the seaweed green shimmer is much more pronounced in real life. 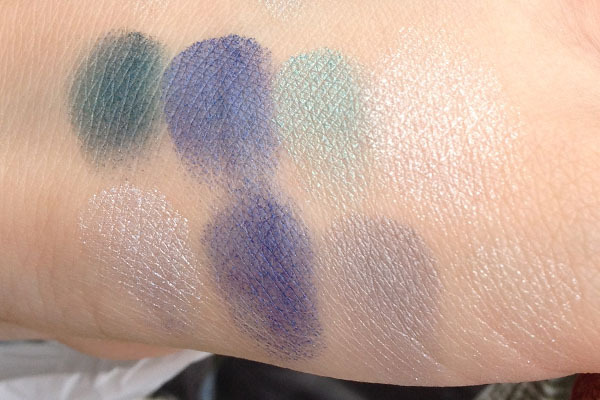 The pigmentation from both eye palettes is disappointing, but this seems to be case whenever a company tackles International Klein Blue. The rest of the colors fares better, but they're still not the best Giorgio Armani has ever released. The face palette was a surprise hit for me. It's a beautiful soft coral pink and a very noticeable white highlighter. 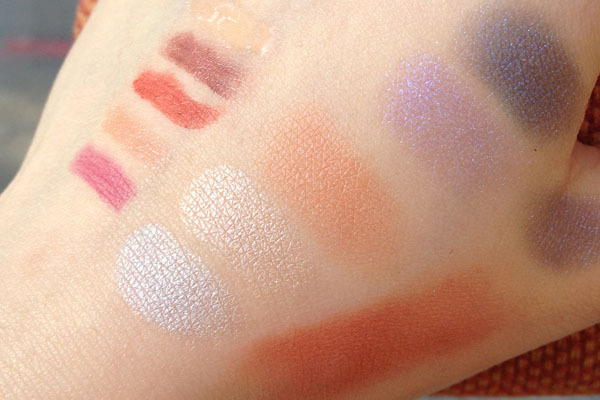 I love that the colors don't look flat even though the palette does not contain shimmer. In my opinion, the glosses are the quiet stars of the collection. 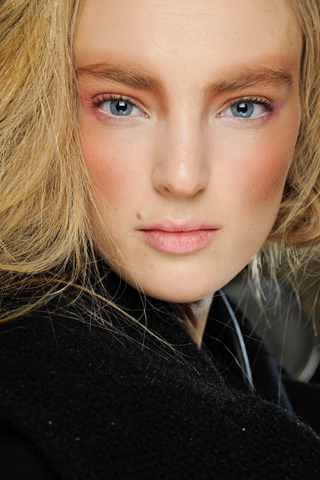 It's difficult to make me feel excited over pink glosses, but those are swoon-worthy shades. I'm especially partial to the pink swatch on the most bottom. I really need to find out what color that is. Giorgio Armani Summer Écailles Collection is already available on Giorgioarmanibeauty-usa.com and Nordstrom.com! Today deserves a quiet hurrah, for I now have a Bachelor of Fine Arts in Writing, Literature, and Publishing from Emerson College. I handed in my 54-page thesis around noon today, and I am officially done with college! Naturally, immediately after that I jauntily skipped (fact) to my local Neiman's. I was in luck: I arrived just as the Chanel SA was putting out brand new, unsullied testers of their summer collection. I was the one who marred the lines of the new bronzers, and I could actually use the included wand to try on the Calypso glossimer. I'm not even abashed for all this. (Forgive me, I just ended an era of my life). I've been thinking about Chanel Calypso glossimer ever since I saw the promo pictures, but was ready to dismiss it as just another orange gloss. 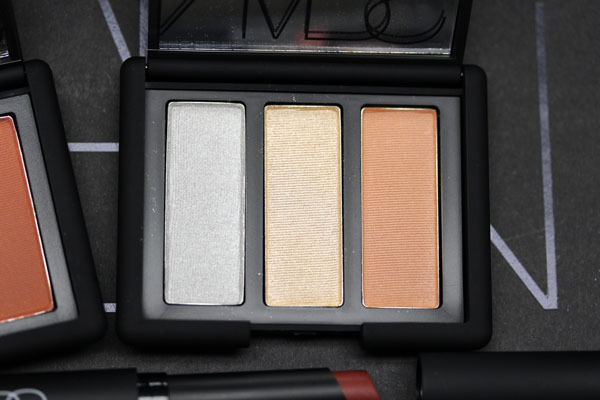 I even brought along NARS Wonder and Le Métier de Beauté Karla Sugar to the counter for a comparison swatch, hoping they were similar enough that I could go without. On the hand swatch Calypso looks just a tad pinker and sparklier than Wonder, but I thought it was close enough that I didn't need it. Even after trying it on my lips, I wasn't impressed. I walked away from the counter and went to Armani. By the time I got to Armani, the gloss had sufficient time to truly settle into my lips, and I couldn't peel myself away from the mirror. Calypso is so pretty! And since I've been worrying about my lack of coral lip products recently (I know. I was shocked too), this appeared at the perfect time. I can't remember the last time a Chanel glossimer excited me so much. 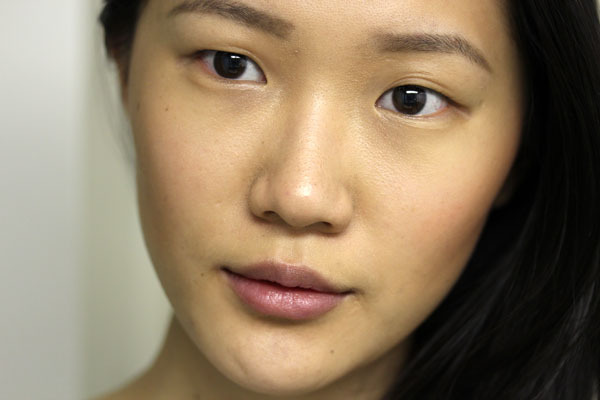 It's not as pigmented as NARS Wonder, but not so sheer that it doesn't show up on your lips. On me Calypso is a light coral gloss (and for reference, Wonder shows up as a bright orange), but I think this is a gloss that will look slightly different on everyone. I guess the photo below is not necessarily a good one to show you how Calypso looks (I'll take a proper one when I get my hands on the gloss), but maybe it can give you an inkling. I urge you to try it if you see it at your local Chanel counter. It's worth a swipe! After about a week of tearing my hair out, I turn to you for help, dear readers. Anyone wants to take a gander at what lipstick she's wearing? It's an intriguing in-between shade. Red with some pink and, to my eye, a bit of orange? It looks like it's matte but may be a regular formula and blotted/worn for several hours. Leigh of Creature of Design (who has super online shopping senses) alerted me to the early release of On the Coast on saks.com. Only sixty of this kit is produced and at least two of them are already gone. Just sayin'. 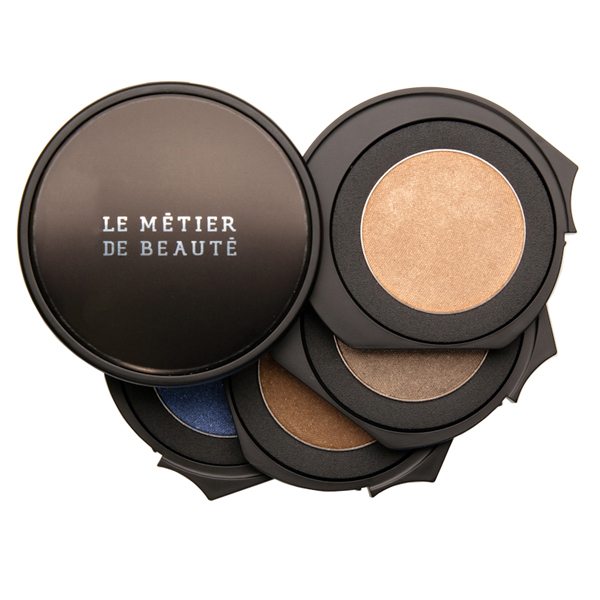 Enter LEMETIER2 during checkout to receive a free Bora Bora eye palette. Thank you Ann for sharing! Our sincerest apologies! 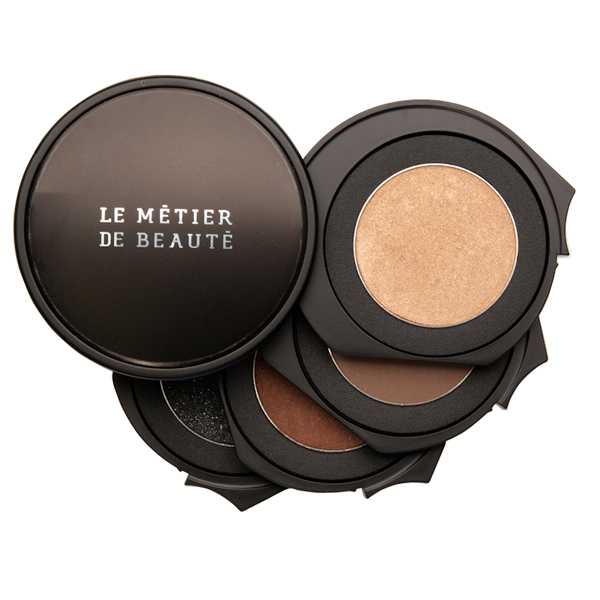 Both Le Métier de Beauté and the Saks.com team did not know that the page would go live prior to the announced launch date. A glitch in their system pushed the page out earlier than planned and for that we sincerely apologize. Due to the overwhelming outcry for “On The Coast,” we are going to do something that we have never done before… make more. Keep an eye on Saks.com for the page to go back up -> you will be able to pre-order “On The Coast” until Friday, April 27th at 12pm or until supplies last. Thank you for your passion and…we’re listening! I hope you won't pelt me with carrots (apples are fine. They're yummier and not as sharp), for I am about to recommend a $245 hair dryer and yes, I know it's quite ridiculous. Though... I purchase $95 palettes on a regular basis. You should really be used to this by now. In my defense, I got the Sultra The Sophisticate Power Dryer at 20 percent off during Sephora's Friends and Family sale. It was the only reason that pushed me to venture into hitherto unknown territory. If you've been following the blog for some time, you should know that I'm absolutely useless at styling my hair, and not for lack of trying. I own a curling iron, a straightening iron, Goody spin pins, hair clips, chopsticks, all manner of hair products (volumizing, straightening, curling, blow drying, mousse, spray, you name it I probably have it) and they lay waste in a corner of my room because I am incompetent when it comes to hair, even though it's secretly my favorite feature. In the past, I've always used drugstore hair dryers. I mean, a hair dryer is a hair dryer, right? It blows cold/warm/hot air. How much difference can a $20 one and a $200 be? 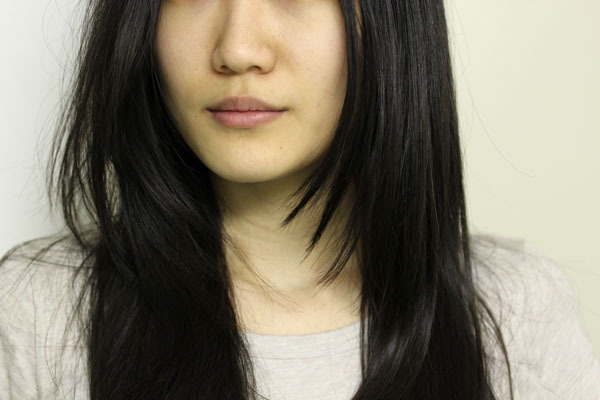 I tried three methods of drying hair: no dryer, drugstore dryer, and the Sultra dryer. With no dryer, my hair looks like the photos below. It's a little hard to get pictures for this post, because it's hard to pick up black texture with the lighting and limited space I have. Without a dryer, my hair becomes a huge mass of flyaways and frizz. It looks messy and unkempt, though one pro is that it doesn't feel fried. 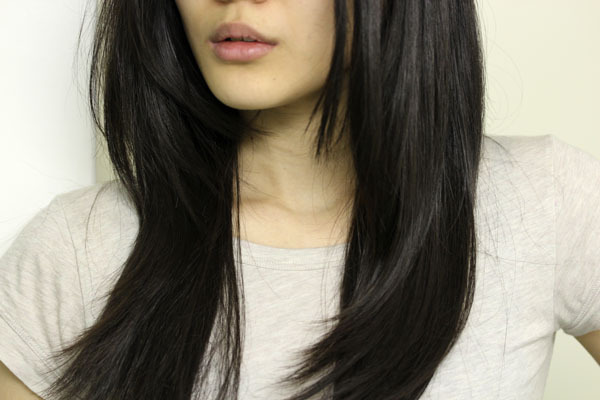 With a drugstore dryer, I can get similar-looking results with The Sophisticate. I didn't take two different sets of photos because they would look exactly the same on camera, but how my hair felt was completely different. With the Sultra, my hair takes on a lightness and a glossier sheen compared to the drugstore dryer. It doesn't eliminate all frizz (note the little flyaways in the last picture), but I think that's as close as natural hair can get. The most important distinction between the two is my hair did not feel burnt and coarse post-drying. With the Sultra, my day-two hair looks better as well. I don't know what they put in the dryer that makes the difference.Words like "Ionic and Ceramic Infrared" don't really make sense to me as a consumer, and a lot of drugstore hair dryers make similar claims (or at least, use similar words). This was one of those things that I winced at the thought of trying ($245!!) but now cannot live without. If I can take solace in anything, it's that this dryer seems sturdy enough to last me forever. And one dryer is really all I need. 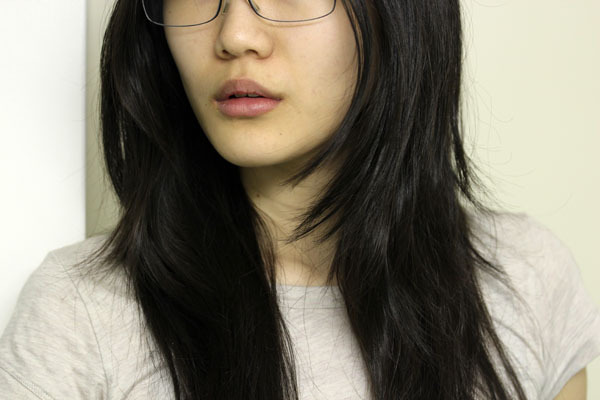 The Sophisticate features three temperature settings for fine, normal, and thick hair. Two air speeds, a cool air blast, and a direction nozzle, which I've been using with a round Moroccanoil Ionic Ceramic Thermal Brush to blow-dry my hair. The results? I've known all my life that my hair is straight, but I didn't know it could be that straight. The dryer is by no means perfect. A couple of things take getting used to. First, the button design is not the best out there (see first picture). The air speed setting is located where I'll logically place my thumb, so when I first started using the dryer, I kept accidentally switching it off. The Sophisticate is also particularly loud. I don't ever want to confirm this, but the person who lives in the adjacent room is probably very unhappy about my late night blow-drying sessions. Here's to hoping that the walls are thicker than I thought, or he's a heavy sleeper. 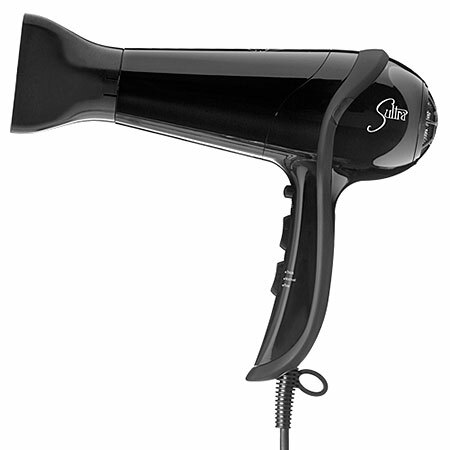 Sultra The Sophisticate Power Dryer retails for $245 and is available at sephora.com. Bonus points for dual voltage! 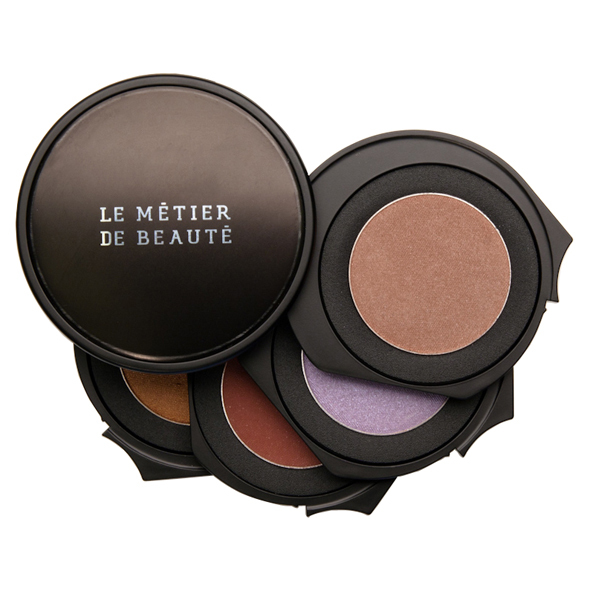 If you've been following Le Métier de Beauté's Facebook page (and if you aren't, you should), you'll notice the infuriatingly vague status update the company left on their wall a couple days ago about three new limited edition exclusives. With no details. Not gonna lie - I sent some frantic emails and tore half of my hair out while waiting for a reply. Turns out, Le Métier de Beauté is celebrating their debut at Saks with three exclusive kaleidoscopes, and the first one they're introducing is On the Coast (pictured above). It's going to be a race to get these kits, and my fingers are itching already! On the Coast is exclusive to saks.com and will be available on April 23. Update: Apologies! I received info on the other two a little later but have not had time to update. Golden Gate Girl will be exclusively available to Saks Fifth Avenue San Francisco on April 25. Shades of Short Hills will be exclusively available at Saks Fifth Avenue at The Mall at Short Hills on April 27. 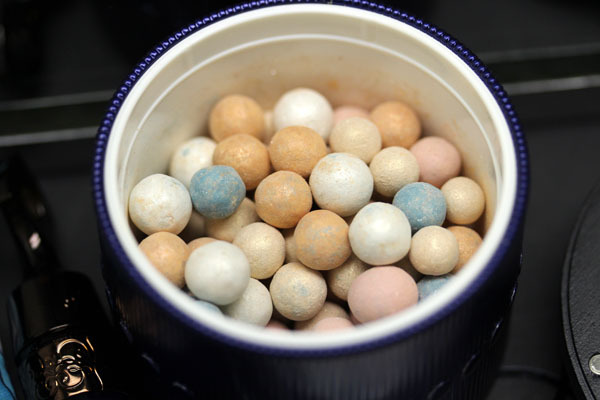 I'm not going to review the Météorites Perles d'Azur in-depth because try though I might (and believe me, I've tried hard) I couldn't capture a photo that would show you how these balls worked on the skin. 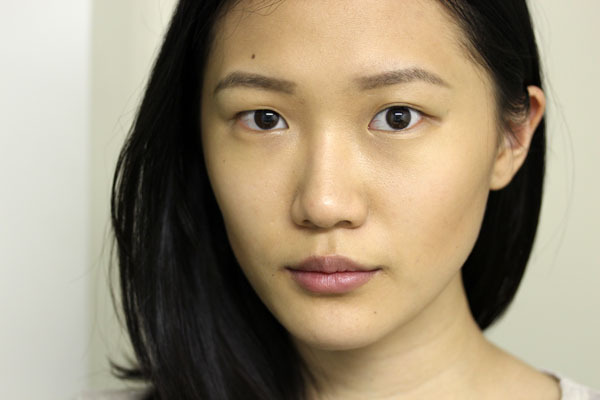 When applied, it gives off a subtle glow – I would describe it less as a highlighter and more like an illuminating powder. I think this iteration of the Météorites is less sparkly/glittery than many others I've tried, especially compared to the holiday ones. Honestly though, even if these did nothing for my skin I probably would have bought it anyway. Those turquoise pearls slay me. I do encourage you to hop on over to Beauty Reflections for Tracy's hilarious and thorough coverage on the Météorites Perles d'Azur. She even has individual swatches of the different colored pearls! And now to the star of the collection, Guerlain Terra Azzurra Bronzing Powder and Blush. 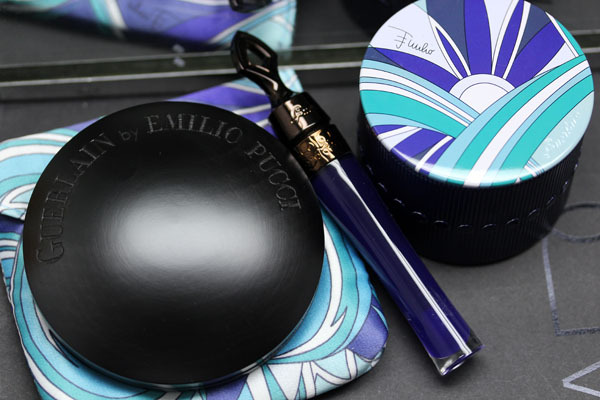 While I love that the company gave the packaging extra thought and housed it in a lush Pucci-print pouch, I have to say it's wasted on me. After all, my makeup bag is already too cluttered to house all my products, it doesn't have space to hold an extraneous pouch, even one as pretty as this. The funny thing about Terra Azzurra is although it houses four distinct colors, once your brush picks up the orange it's like the rest doesn't exist. 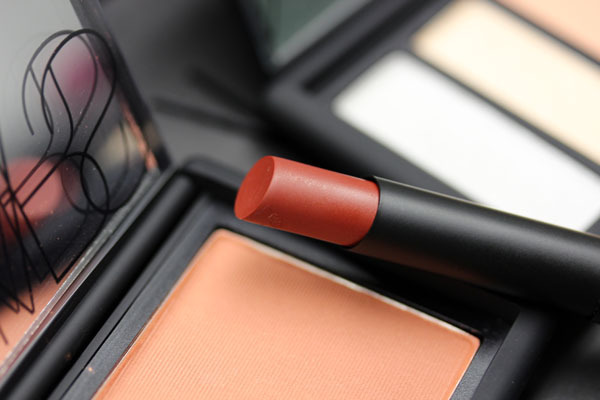 If you swirl your brush across the pan, chances are the resulting color will be a frightful bright orange. If you target the application at either half, however, you get a regular bronzer/blush duo (for swatches, see this earlier post). 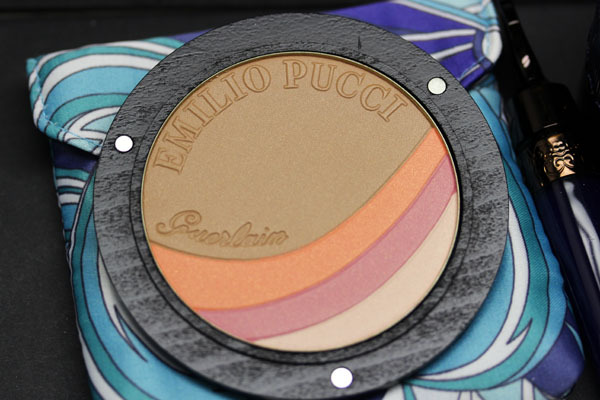 Guerlain's forte is in their powders, and Terra Azzurra is no exception. 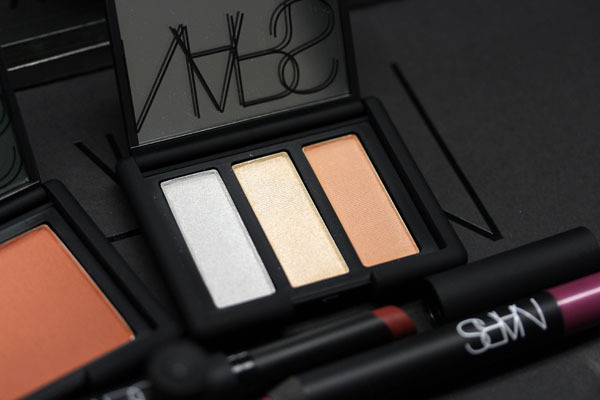 The powder is finely milled, smooth, and blends easily. It features the heavy floral scent typical of Guerlain powders, which may be the only scented makeup product I actually like. Halfway through applying, I realized that the colors in the pan looked exactly like those used in the Rodarte fall '12 runway look (the actual products used are NARS Bronzer in Laguna and NARS Blush in Gaiety), so I decided to have my slice of fun. I used the lighter pink shade at the inner corners and bottom lash line, then applied the darker pink shade to the outer corners of my eyes (it was actually quite difficult to get the colors to show, but since Terra Azzurra was never meant for the eyes, I let it slide). 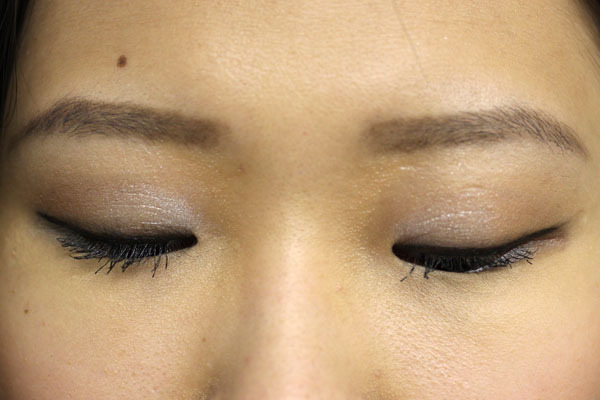 I used a big eyeshadow brush and fluffed the bronzer shade from the lash line to the brow bone. I also shaded a bronzer arch just above my brows. 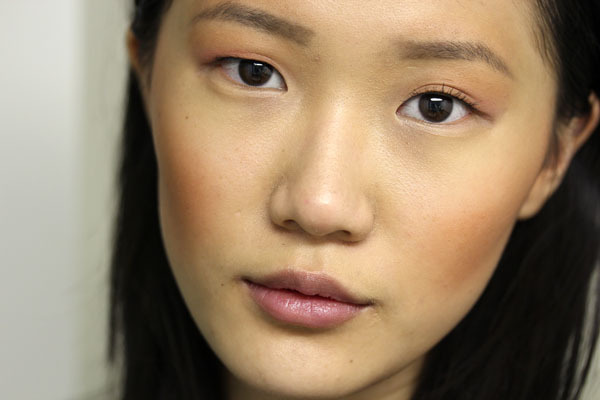 I swirled a blush brush across the entire pan and layered it repeatedly on my cheeks to create the burnished look. Finally, I swiped a layer of Guerlain Noir G Mascara on my lashes to finish. Guerlain Terra Azzurra Bronzing Powder and Blush retails for $75 and should be available at Guerlain counters nationwide. 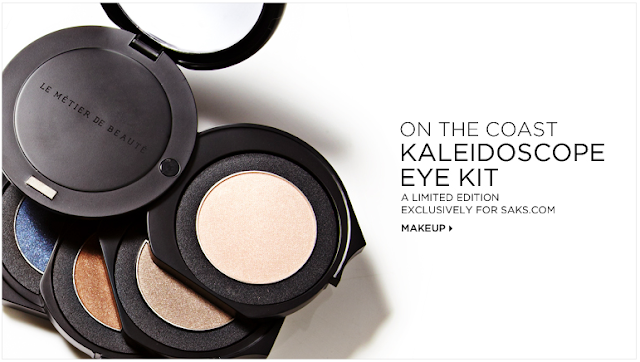 Beauty Insiders can also order it from sephora.com. Yesterday, I was yelled at on Twitter for delaying my coverage of NARS Ramatuelle Eyeshadow Trio, and I understand. I would be anxious too if I was waiting to see this palette. In fact, it was the first thing I knew I wanted from the entire collection. Ramatuelle consists of two shimmery shades of silver and light peach and one matte apricot orange. All three of them are light but not sheer. In the pictures below, the NARS associate applied the light peach all over my eyes and under my brow bone. She concentrated the application of the silver in the inner half of my lids, and the orange on the outer half, as well as the crease. She also applied the silver on my bottom lash line to brighten up my eyes. 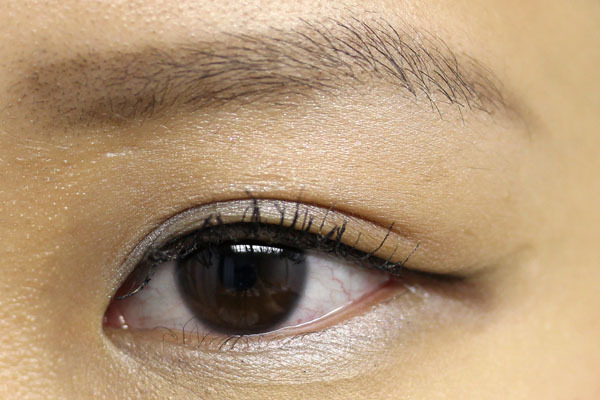 She finished the look with a simple black line at the base of my lashes and a good coat of mascara. 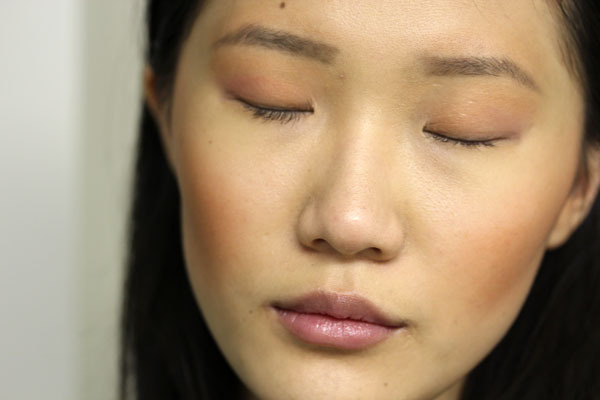 One thing to note: the eyeshadow creases if you don't apply it over a base (as you can see in the photo above). I've tried it again over the NARS eyeshadow base and it lasted all night. Since the eyeshadows are so light, I think Ramatuelle is a great option for those afraid to plunge head on into color. So far a lot of comments I've heard regarding Ramatuelle is that it might be too warm, which I disagree. I think the silver balances out the orange in the trio and make for a wearable combination. 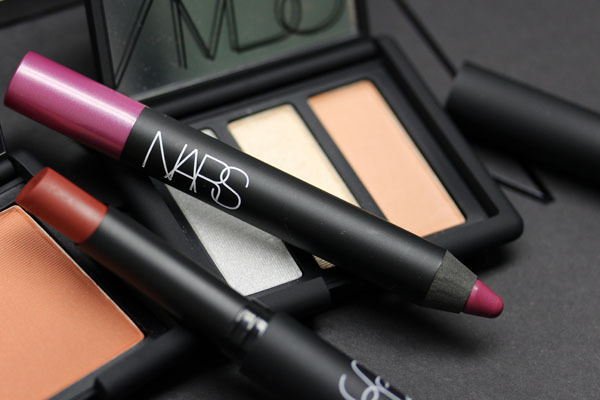 If you have a Sephora or NARS counter near you, do give this trio a try before writing it off. Like Grand Palais from last year's collection, I think many would be pleasantly surprised at how well they can pull this off. NARS Ramatuelle Eyeshadow Trio retails for $45 and is exclusively available at the NARS 413 Bleecker St Store and narscosmetics.com till May 1. 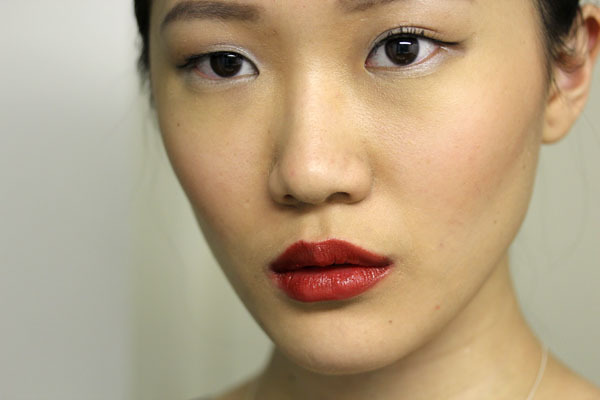 In this next installment of what is essentially NARS Summer Gushing, we visit the other matte lip offering. 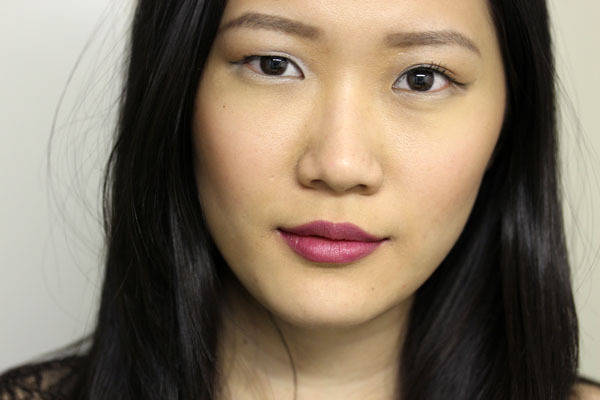 NARS Never Say Never Velvet Matte Lip Pencil is a subdued hot pink with the barest hints of lilac peeking through. 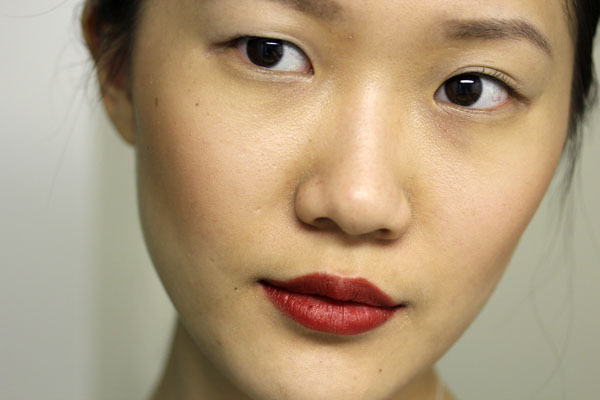 The Velvet Matte formula provides a slight sheen to an otherwise completely matte lip. Like the Pure Mattes, I have to say it is neither moisturizing nor drying. If you suffer dry lips (like me), carry a balm around. Though applying it will alter the finish, I firmly believe having shiny lips is better than enduring cracked ones. The Velvet Matte Lip Pencils were never known to be long lasting (on me, except perhaps the darker shades). Never Say Never lasts about three hours and completely disappears after a meal or a beverage. However, it is such a beautiful shade that I am willing to reapply it every couple of hours or so, and it helps that the pencil form makes it brilliantly easy to do so. I think Never Say Never fits neatly with the colors coming out this summer, and since it's not super bright I can envision myself wearing it well into Fall (though my soul died a little when I typed that last bit. It's barely spring here!). NARS Never Say Never Velvet Matte Lip Pencil retails for $24 and is exclusively available at the NARS 413 Bleecker St store and narscosmetics.com. NARS Moscow Pure Matte Lipstick was a surprise hit for me. I suppose I was too entranced with Ramatuelle and Liberté (swatches of which can be seen here) when I saw the earlier press releases to take notice of anything else, and with my dry lips I instinctively flee from anything matte. But I was at the physical store and the color in the tube grabbed me. After trying on the eyeshadow trio and the blush, I asked the SA if I could try Moscow as well. After that, I couldn't leave without it in my bag. Moscow is an orange brick red. 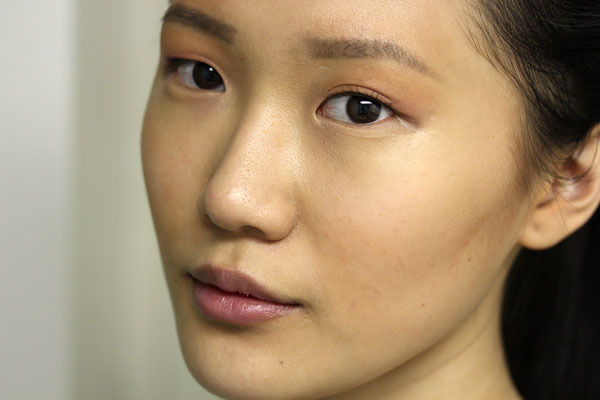 The Pure Matte formula is one that is not necessarily drying, but not moisturizing either. I don't find that it saps the moisture out of my lips, but as someone who has dry lips it does become slightly uncomfortable to wear a couple hours in. I usually have a potted lip balm with me to swipe over my lips for those occasions. I have a bonus preview of the purple gloss Porto Ercole from Guerlain's summer collection. Here it is layered over Moscow. As you can see, the gloss works to darken the color just a smidgen. If you remember Dior's limited edition Rock Coat nail polish, Porto Ercole works exactly the same, except in gloss form. I was wearing Le Métier de Beauté Red Velvet a few days ago, and while I love the color, I was thinking it was high time to retire my bluer reds for a lighter touch. I find that Moscow is just the substitute I was looking for. It packs a punch, but doesn't scream as loud. Definitely a great red to wear for summer. NARS Moscow Pure Matte Lipstick retails for $25 and is exclusively available to narscosmetics.com and the NARS 413 Bleecker St store till May 1. Remember to use code SIERRA upon checkout for a 20 percent discount!